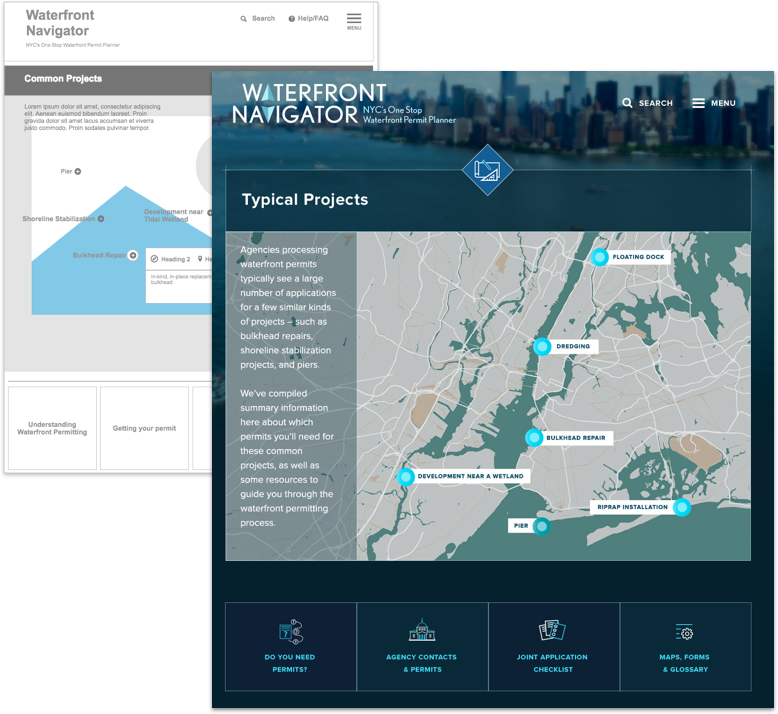 The Waterfront Navigator project is the result of a year-long effort involving five city, state and federal agencies who engaged SOS to create an online resource to simplify the process of applying for a permit to develop along NYC’s waterfront. 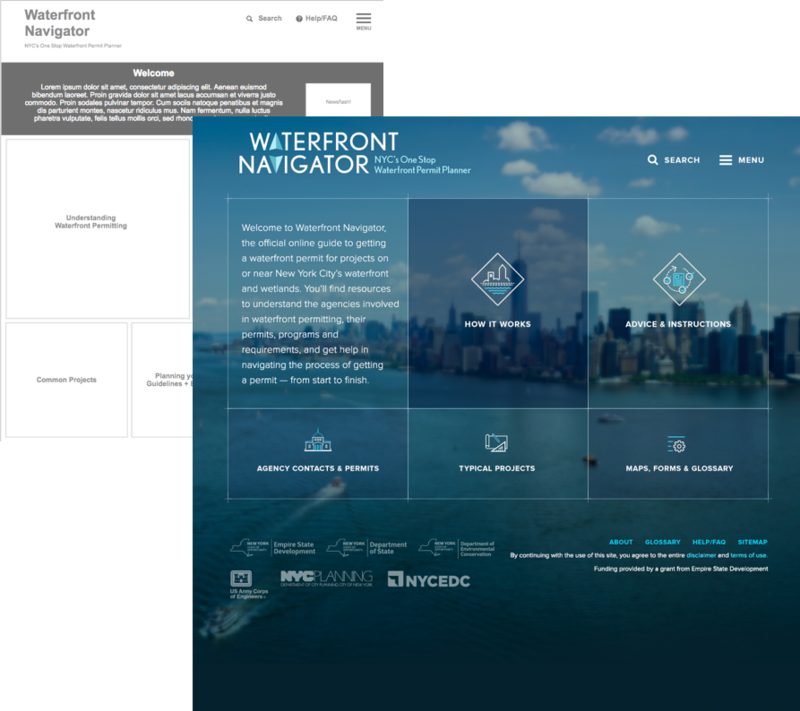 Citing a complicated, often expensive process for applicants, the New York City Economic Development Corporation saw value in creating a “one-stop” resource, where all information relevant to waterfront permitting could reside in one easy-to-navigate website. 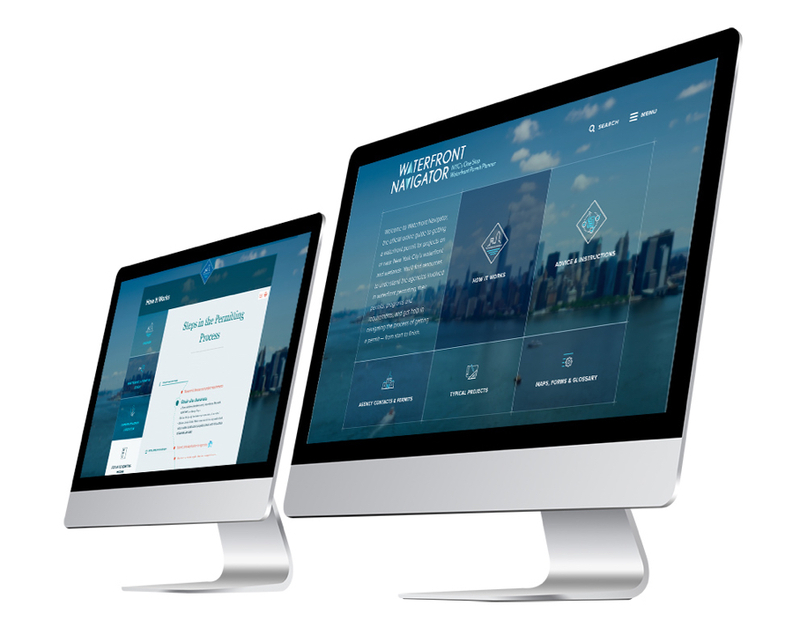 With a varied audience in mind, we created a user experience that is easy to navigate and highly organized, accommodating many pages of content that are often quite detailed. 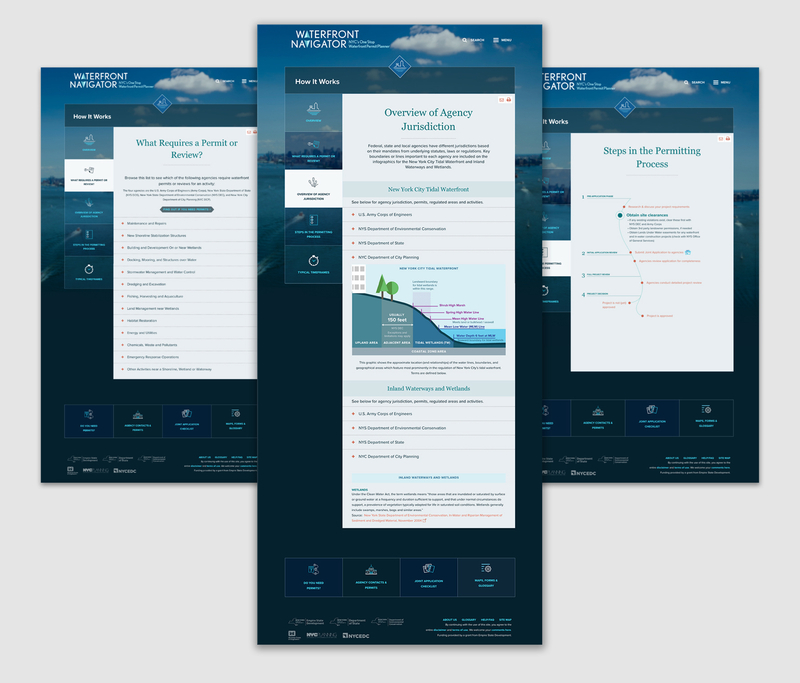 Working in close partnership with the agencies, we wrote all content within the site, condensing material from many sources and eliminating agency-specific jargon in favor of simple, direct language. 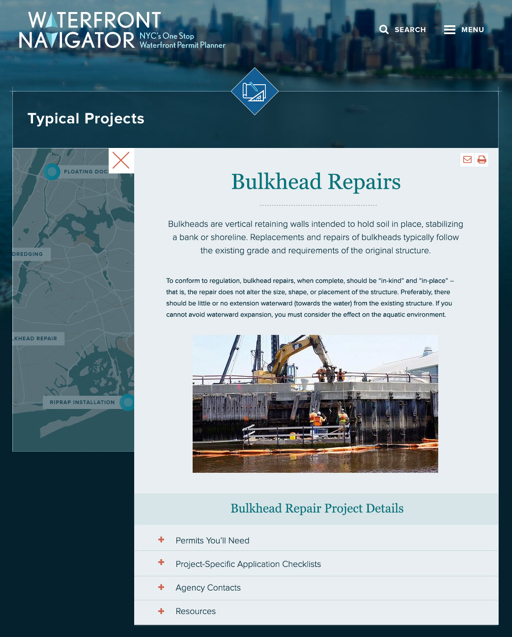 We developed interactive tools to help applicants better understand the process and what a permit application for their project might require. The site structure we developed focuses on the providing guidance to a key 80% of permit applicants: small bussiness and home owners who aren't planning to hire a professional consultant to help them through the process. We identified the most common types of projects and where applicants typically make mistakes. 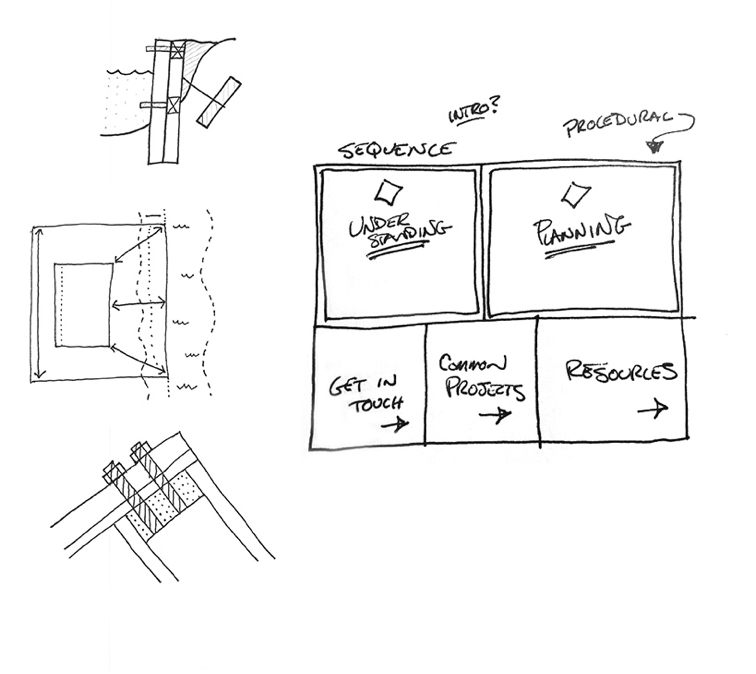 With these user needs in mind, we designed the site sections to provide simple access to step-by-step instructions, illustrated examples, and who to contact if you need more help. We rapidly created a prototype of the site and tested it with real users. The results were analyzed and used to improve the site's written content as well as the User Experience. 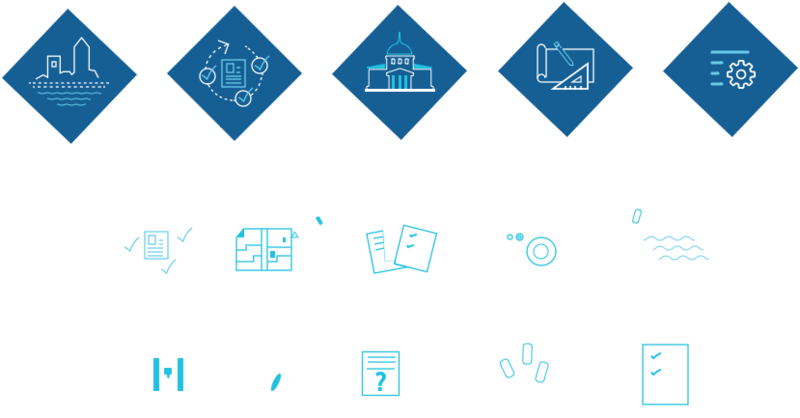 Having conducted extensive research into the subject matter and personas of the user groups, we began the process of creating a name and logo with a wealth of understanding to build on. Backpack presented the NYCEDC team with multiple name options built on logical rationale. The name needed to be both straightforward and memorable. For the logo design, we began with a coastal-themed palette and drew from maritime mapping symbols that would invoke a feeling of being oriented and directed. A fundamental challenge existed in bringing together vast amounts of information, while also making a simplified user friendly resource. The project team at NYCEDC is extremely pleased with the work product and would happily work with them again.